Home Blogs Snap Shots You want to be a war zone photographer? You want to be a war zone photographer? One of the extreme forms of photojournalism is war zone photography, and one of the extreme exponents of war photography was a Hungarian Andre Friedmann. Friedmann’s war zone photos are not well known, in fact his name has gone into obscurity, but the work of an American war zone photographer Robert Capa is very well remembered. The interesting part here is that Friedmann and Capa are one and the same people. As a fearless war zone photographer, Robert Capa has had his pictures held up as shining examples of fearless photojournalism, while poor old Friedmann has really been forgotten. Getting to the truth behind this strange fact brings in a third person, Gerda Pohorylles. Gerda, also known as Gerda Taro, was Andre Friedmann’s agent in his early days in Europe. It was Gerda who decided that the market for his pictures would be much larger if the Europeans thought he was a famous American photographer, and so Robert Capa was created by her. 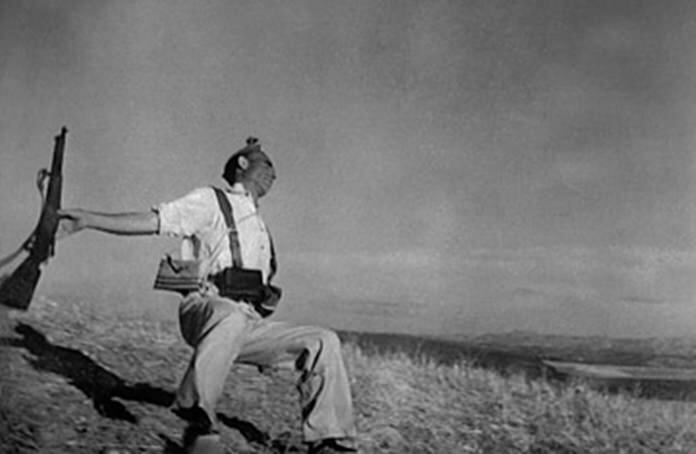 Amongst the famous images from Europe are his shots of the Spanish Civil War, including the photograph of a Spanish militiaman literally at the split second of impact, with death recorded for posterity. The decisive moment as Henri Cartier Bresson has said. The un-named soldier was not the only one to perish in the Spanish conflict as poor Gerda, who was also a photojournalist, met her end reporting that conflict. Hungarian Friedmann, as Robert Capa, did eventually emigrate to America and was to accompany the American forces back to Europe in 1944. His photographs of the D-Day invasion are now legendary. War heroes are immensely popular figures in America and the photographer Robert Capa was the friend of many film stars, writers and other celebrities such as John Steinbeck and Gary Cooper. He covered five wars in all. The Spanish Civil War, the Chinese-Japanese War, WW II in Europe, the Israeli War of Independence and the French Indo-China War. Whilst that saw him getting award-winning photographs, eventually this need to get close to the action finally killed him, when he stood on a landmine in May in Vietnam. It is said that his body was found still clutching his camera and the film inside was unharmed, but I could not verify this. However, he was a war photographer to the very end. As well as his 70,000 photographs, Capa left the world a photographic legacy in the form of the Magnum Agency. This huge photo bank was created by Capa, in conjunction with the famous French photographer Henri Cartier-Bresson, and today still represents the more excellent photographers around. Capa will not be forgotten like Friedmann’s, old negatives in photographic archives. Of course, getting close to the subject is still one of the primary rules of picture taking. “Step several meters closer” is one of my ways of saying the same thing. When you look through the viewfinder at the subject, do just that – with the camera to your eye walk towards the subject and see just how the emphasis changes in the picture. The closer you get, the more the subject will fill the frame and dominate the entire photograph. In fact, this weekend take one shot from where you would normally take it, then take another couple as you walk closer. Compare the end results and see if Robert Capa (Andre Friedmann and Harry Flashman) are not correct. With Pattaya being a tourist resort city, every day you will see holidaymakers recording their trip of a lifetime, from about 20 meters away. This includes shots of the hotel and their friends out front. The end result will be disappointing with tiny little people in front of the building. If they would only walk several meters closer it would be so different. Some days I think I should mark the spots for the photographers to stand and the subjects to be placed, in the front of our major hotels. Oh No! It’s Songkran again!